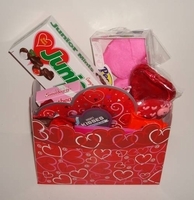 Valentine candy gift basket is decorated with hearts and filled with the most popular Valentine candy. Your Valentine will be delighted to find 3.5oz box of junior mint hearts, pink heart shaped peeps, heart shaped box of Hershey kisses, Reese's peanut butter hearts, conversation hearts and more. Each heart box is 6-3/4 x 4 x 5" wrapped in a gift bag with a pretty ribbon bow. Send your valentine a gift basket delivered right to there door with your own special message.